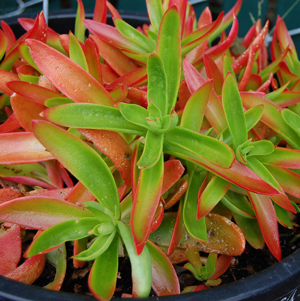 ‘Campfire’ Crassula Plant is a tender, soft succulent with simply brilliant coloration. With its orangey-red and vibrant spring green leaves, it resembles its namesake both in color and in form. Its elongated leaves grow upright on sturdy stems that can reach 20 inches in height, just like a campfire’s flames. Campfire yields its white blossoms in the wintertime and will appreciate a southern exposure if brought indoors. All of our ‘Campfire’ Crassula coccinea Succulent Plants are grown and shipped in fine quality growing medium and are guaranteed to arrive alive and ready to thrive. Comment: It arrived looking awesome and healthy! Now it is blooming. Outstanding packing! I love my Crassula plant.